It's likely you may have never heard of Pedro Calderon de la Barca or his play la vida es seuno. His enthralling story is one of the defining dramas of the Spanish Golden Age. 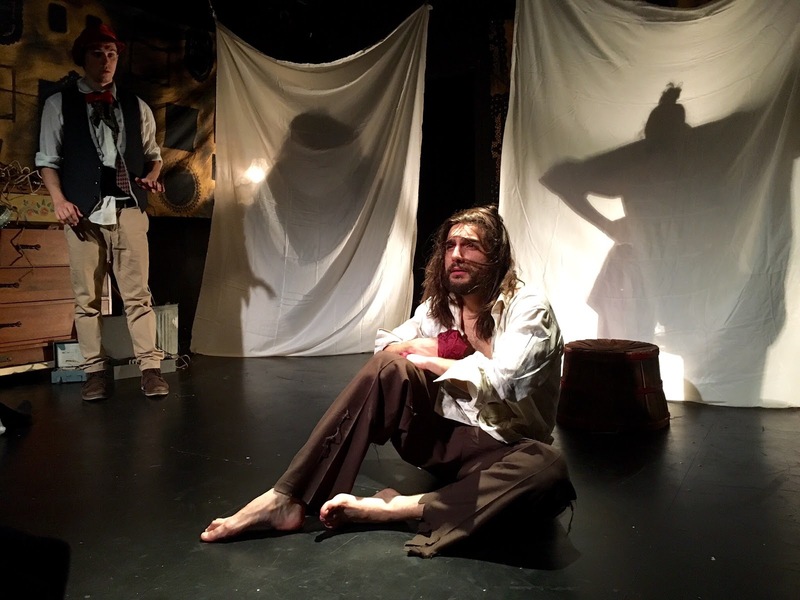 Exploring the lines of reality and dream, Eager Risk Theater's adaptation Life is a Dream is a haunting take on the classic that awakens the drama for a new audience. Adapted by Annie R. Such, Life is a Dream is a multi-plot saga about an imprisoned prince, a vengeful young girl, and cousins seeking glory. Life is a Dream tells the tale of Segismundo, the son of King Basilio, who is locked away after a prophecy states that his son would cause disgrace to Poland and murder him so Basilio has Segismundo locked away. Rosaura, eager for vengeance on the man who left her at the alter, and her fool Clarin discover Segismundo and soon learn that Basilio wants to prove the oracle wrong. Meanwhile, Duke Astolfo encourages his cousin Princess Estrella that they should be wed for they would be next in line for the throne. Like many plays of the time, the stories intertwine and lead to a theatrical resolution. Playing with the theme of dreams and finding the lines of reality, Life is a Dream is an adaptation of the modern age. Playwright Annie R. Such does an impeccable job at storytelling. Such breathes life into her adaptation. It’s likely you may not know the story and Such does a strong job allowing the tale to flow naturally. For the most part, the heightened language feels natural off the modern tongue. Thankfully for Such, the characters of her play fit common archetypes with clear cut objectives. Still, she finds nuances that make them feel fresh. With a piece that spans multiple acts, Such is smart by condensing it in a brisk one act while maintaining Calderon de la Barca’s integrity. By playing with the lines of reality, director Christina Ashby creates a world of surrealism. The set by Lia Woertendyke is a conglomeration of items, fabrics, and textures that range from decimated to elegant. It evokes a place of ruin that could easily have been conjured up by the mind. Ashby also makes great use of the three draped white fabrics. With shadows created by lighting designer Kyle Kravette, Ashby’s three-piece ensemble spends the majority of time behind the cloth lending solely their voice. The trouble though was how the other characters interacted with them. For the most part, Ashby had her actors play out to the ensemble and it felt a tad awkward. With that being the biggest woe, Ashby did an incredible job imagining the world such and Calderon de la Barca crafted. To add to the drama, composer Thomas Burns Scully used incidental music and underscoring. The music that was present was likely something Calderon de la Barca would have enjoyed. The Spanish guitar was fantastic at setting the mood despite feeling disjointed from the location of Poland. The company that comprised Life is a Dream had a plethora of talent. With the language living in a classic world, there were some who were able to tackle it better than others. The leader of the pack was one who played a sidekick. Hugo Fowler as Clarin the clown was a star. Fowler was the light in the darkness of the play. There was an ease to Fowler’s comedy and ability to draw the audience into loving him. As wide eyed vengeance seeking Rosaura, Charlotte Vaughn Raines was quite strong. Raines transitioned from tomboy to princess to create a resilient woman. Raines and Fowler were a dynamite of a pair. The other duo of note was Michael Striano as Astolfo and Jeannine Scarpino as Estrella. They personified regality. Giacomo Rocchini as Segismundo had a difficult role and sadly it seemed to take a toll on him. Rocchini was like PTSD Huck on “Scandal.” His performance was scattered as the character called for but it greatly needed to be toned down. By no means is Life is a Dream perfect. But the imperfections are endearing. There's no denying the artistry and detail in the production. Keep an eye out for future productions from Eager Risk Theater. You’ll be intrigued by what they have to offer.